Looking for a dentist with a gentle touch and personalized care? Welcome to Fletcher-Stark Dentistry, the Albuquerque, NM office of prosthodontist Dr. Madelyn Fletcher-Stark. Our knowledgeable and friendly staff make patient satisfaction and high-quality oral health care a top priority. We have been established since 2016 and provide premier family, general, and esthetic reconstruction services. Our diverse range of treatment offerings allows our dentists to transform any patient’s smile into the picture of health and beauty – whether your concerns are minor cosmetic flaws, or tooth decay and missing teeth. Dr. Madelyn uses high-quality dental laboratories and the latest in advanced technology and materials to bring you comprehensive prosthodontic treatment. Click here to access our convenient online patient forms. At Fletcher-Stark Dentistry, our focus is on our patients. We strive to make every patient experience as comfortable as possible for a stress-free visit. We pride ourselves on our compassionate and conservative approach to dental care. If your smile could use a boost, or if you’re dealing with complex oral health problems, contact Fletcher-Stark Dentistry for a comprehensive consultation. 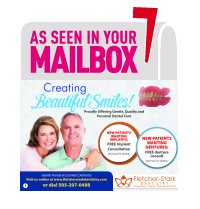 We help our patients get the beautiful smiles they want with modern cosmetic dental solutions. I had a terrible fear of the dentist however I was immensely relieved to find that the staff as well as Dr. Madelyn were not only capable but comforting and empathetic. I am not an easy patient and I highly recommend these excellent providers. My appointment with Dr. Fletcher-Stark was to have an old filing replaced with a new one. It was the most relaxing and non painful experience. Both the staff and Dr. Fletch-Stark were kind, very positive, and made me feel at ease. I will gladly recommend Dr. Fletch-Stark to all my friends and acquaintances. For two years I had pain and discomfort from two crowns with occlusion issues that my previous dentist was unable to remedy. When Madelyn Fletcher-Stark took over the practice, she replaced those crowns at no cost to me. The new crowns work like my real teeth. She took time to make moving models of my teeth to design crowns that fit properly. The extra time and skill that were lavished on me changed everything. Thank you Fletcher-Stark Dentistry.